This is the final behind-the-scenes blog post about my timelapse short film, REBIRTH. In previous posts I spoke about my visits to Laudat and Trafalgar, and Warner and Horseback Ridge. Here, I’ll take about my visit to Syndicate and will give some insight into the original lyrics for the film. Yes, that’s the name of the bar! You won’t find it on any map, but this is a popular stop for travelers between Roseau and the north of the island. The bar is known for its roasted stuffed bakes and roasted corn. And the friendly owner refers to everyone who stops as “baby”… hence the odd name. I spent about an hour there and had breakfast (a cold Kubuli and a couple stuffed bakes). She also has a wide variety of local bush rum available, for those who dare! Much of Syndicate is a part of the Northern Forest Reserve, which is the natural home to our endemic parrots, the Jaco and the Sisserou. 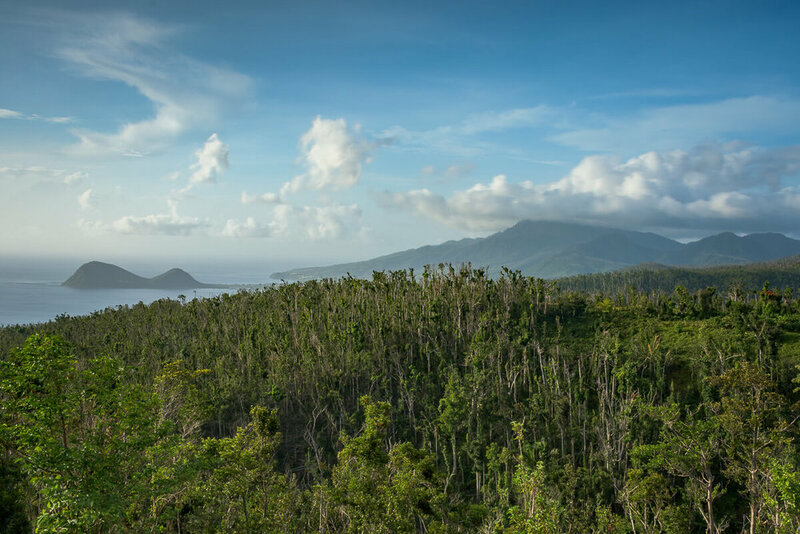 You can also find the trail to Dominica’s highest mountain (Morne Diablotin) along the Syndicate Road. I had not been to Syndicate Nature Trail since the passage of Hurricane Maria and I was stunned at how much the forest had changed. You can see evidence of the powerful hurricane in the fallen trees and the still-young foliage. Of all the locations I visited, Syndicate is probably the one place I spent an entire day. I found that there was so much to see – farms, forests, rivers, mountains. They were all worthy options that day. I attempted to capture at least 10 individual sequences on that visit. That’s a lot, considering that each sequence could require at least 200 images and an hour to shoot.I am happiest with the image below. Check out the conspicuous hills of the Cabrits National Park on the left. You might be wondering, “why is sound so important in a video that it would need a behind-the-scenes section?” Let me answer your question with another question. Can you imagine watching your favorite movie or TV show with absolutely no sound? Sound (both sound effects and music) play a big role in putting the footage into context and creating a fuller experience for the viewer. More specifically, since I’m shooting still images for my timelapse films and not regular video footage, I am not automatically picking up sound of the environment while shooting. As a result, I have no choice but to add sound during post-production if I want the best final product. For the first time since I’ve started doing these timelapse videos, I decided to use nature sound effects in the final video. Birds chirping, a river running over rocks, waterfalls and gusting wind. These are all used throughout film. I don’t currently have the equipment to capture great quality environmental recordings, so although we have these natural scenes in abundance in Dominica, I could not use those sounds. However, I was able to find various sample packs on the Internet was pleased with the result. Music is even more important than sound effects, in my opinion. A soundtrack adds a certain glue to your video. I call it glue because the soundtrack ultimately creates the mood of the video; it evokes emotions from the viewer and brings the film together. What was simply a series of images sequences can now be viewed as a movie, with distinct dynamics, varying moods and an underlying beat. I was very careful about choosing the soundtrack for this video. I knew the message that I wanted to convey and that required a certain mood. The music would have to set the tone. After searching for a couple weeks, I finally found an appropriate instrumental soundtrack. It was slow-paced (unlike the music from my previous videos) and built up with a crescendo and a powerful climax. I was excited! About a week later, I came across a version of the same music, but this version featured lyrics! I decided right away that my soundtrack needed words too. The right lyrics would create a more significant emotional impact. Now I just needed to find a songwriter and a singer! I turned to my favorite singer/songwriter – Golda – and asked her to pen an original song that speaks about Dominica’s recovery after Hurricane Maria. She was excited about the project and started working on it immediately. Golda and I have worked together on numerous projects in the past, and not only was I confident in her ability to write a great song, but I was also sure that she could sing it beautifully. After a few weeks of back and forth, tweaking and fine-tuning, she delivered a masterful piece called Rebirth. It was then my turn to do some editing and audio mixing, and another week passed. When I finally had something that we were both satisfied with, it was time to add it in and arrange for the release of the short film! Newer PostThe official release of REBIRTH!